Advertising on Facebook gained traction in 2011 with an 18% increase in click through rates (CTRs) and improved value for advertisers according to a report from social advertising group TBG Digital. But while the performance of Facebook display ads improved, the most effective advertising unit was the new ‘like’ based ad function that rolled out in quarter four: sponsored stories. Simon Mansell, CEO of TBG Digital, says users are increasingly discerning about what they view on social networks and advertisers utilising Facebook need to match their content with the best advertising method. Cost per click (CPC) for Facebook ads remained flat between quarter three and quarter four last year. However, Facebook incentivised advertisers to keep traffic with the network, charging a 45% lower CPC for ads that kept traffic within the Facebook environment than ads that sent users to offsite locations. “The potential cost savings available by maintaining traffic within the Facebook environment is particularly compelling and demonstrates its effectiveness as an advertising channel and also as a ‘destination’,” Mansell says. The findings, from TGB Digital’s Global Facebook Advertising Report, also claim that Facebook earned substantially more during the course of the year from its advertisers, with CPM rising 23%. This is an important financial indicator for potential investors in the company. Revenue was dominated by a select few with the top five sectors – finance, retail, food and drink, games and entertainment – accounting for almost 70% of the total impressions served on Facebook. According to Business Insider, TBG Digital admitted to excluding one large gaming client from the analysis, which the news site speculated was Zynga. Business Insider commented that Facebook is heavily dependent on Zynga’s health for a portion of its revenue as the gaming company hands over a 30% cut every time a user buys something in-game via Facebook Credits. 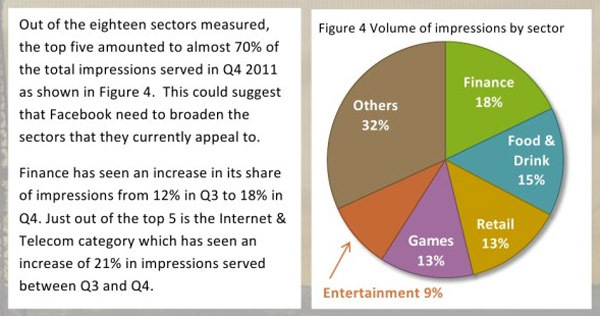 Of the sectors analysed using clients from TGB’s customer base, food and drink recorded the highest CTR levels, largely due to successful fanning campaigns in that sector. 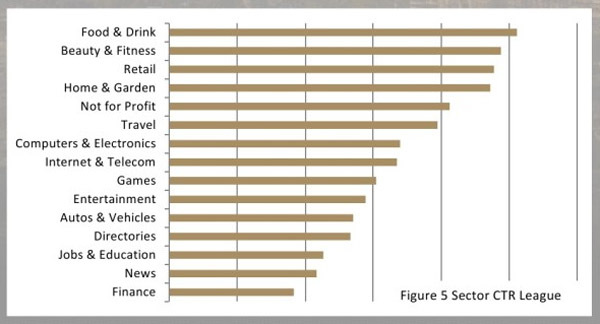 Beauty and fitness, retail, home and garden and not for profit round out the highest five sectors of CTR. With the reported introduction of mobile ads (Facebook’s mobile apps are currently free of display advertising) and sponsored stories within the news feed arriving this year, opportunities for advertising on Facebook will continue to grow. Quarter 4’s Global Facebook Advertising Report is based on data from 266 clients and 326 billion impressions.